Furniture and 90% of the office was moved on Saturday, December 12th. Our computers stayed behind because we didn't have service in the new space. 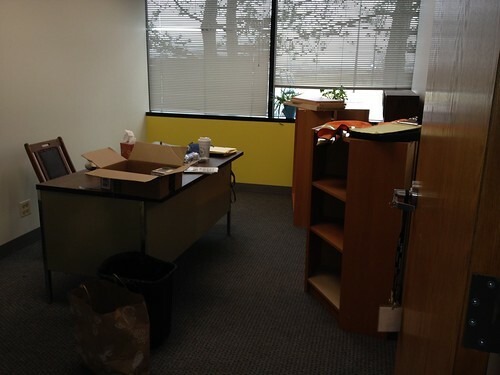 At noon, my new office looked like this. 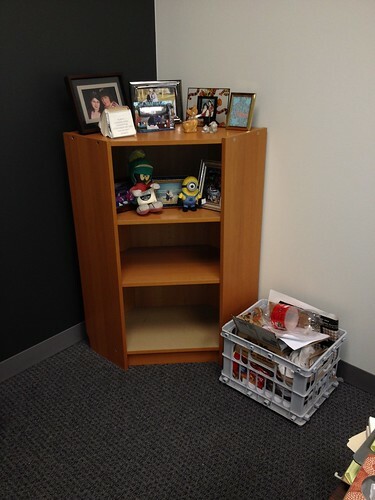 "Yeah, those bookshelves were in my old office so I guess just put them in my new office." Originally, we were going to use the extra office we have as a library, of sorts. As you can imagine, we have a lot of reference material for construction, mining and demolition. It's a very narrow slice of the publishing world, but there are books printed about these topics and we get a couple every so often. As our area of work is not taught in universities, much of our knowledge comes from on-the-job experience and the rare tome or paper detailing the effects of ground vibrations on structures. Books tended to be scattered about people's offices and we thought it would be better if we had one spot for them. But, files this idea under "best laid plans". That "library" is going to be someone's office in the next few months so the shelf units were stuck in my office until further notice, since that's where they had started in the old space. On Wednesday, December 16th, with Internet up and running, we moved completely and my computer was set up. Things are a mess, as you would expect. I had to empty the desk so I tossed all my files and stuff into bags and boxes. The shelf units were moved away from the hole in the wall where the sliding window was to go so I could see anyone who walked in. At this point, I have sorted through the empty box to find all my files and at least get back to working, sort of. Since mid-December, things have come along. The corner cabinet was moved into place and my photos and mementos placed on it. That's a paper recycling cube to the right. Our cleaning service doesn't quite understand that we actually recycle here so all of our carefully sorted recyclables have been dumped into garbage bags. But, they are new and we are new and we'll get this sorted out. The bottom of this unit now has my rocks from various projects. That might seem weird but I've been on some big jobs and I have rocks or chunks of concrete from Soldier Field and 1930's-era Sheridan Road, terra cotta from a building that once stood where Prentiss Children's Hospital is now and rebar from Michigan Avenue. These pieces were scattered about my old office. Now, they have a place to be. The piece of rebar is going to hang on the wall, but I need to get my posters and other wall things up first. They finally got the window installed right before Christmas. At one point, I was kind of sad to lose a whole wall of potential display area, but I have to say, being able to see people coming in is huge. We don't get many people here; UPS, the mailman, building maintenance; but seeing them and my co-workers come into the building is very important. 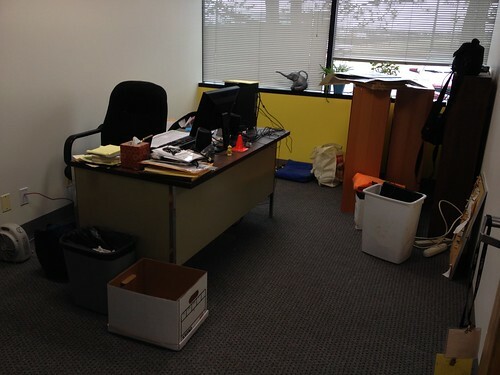 The other thing that I've discovered is how expansive it makes the office feel. I have huge windows to my east but being able to look out of the office in what amounts to another window is wonderful. I generally don't have claustrophobia but extra light is a good thing. Two of the bookshelves, of the four I had, were commandeered by Tara. I still have one plus this corner unit. I really had no use for the other ones. I was kind of amazed at how much stuff I kept because my former boss said "It will be useful sometime." Um...no...not really. Back in October, when we started the packing process, we took 8 construction garbage bags of garbage to the dumpster. Since moving and, as we've all settled in, there have been 8 more bags of garbage out the door. In a typical week, we don't generate much. Our data is 80% digital now. Our cleaning service comes every other week. It works.